Please note: This is an old review, imported into our database. 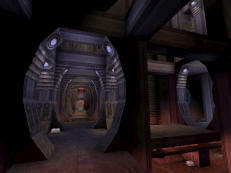 DM-FuryXXI is another fine map from Arbitrage. Medium sized, set in some sort of facility, the map revolves around several areas. First, you have the connecting points to the hallways, which are always dangerous. Second, you have the basement, which is difficult to escape with your life, but fun at the same time (not too much crossfire there). Third, you can position yourself in several unsafe sniping areas to pick up a few frags. One of them is at a player start, which was a good idea by Arbitrage. Layout is very good, as is item placement. The map plays medium to fast, and requires at least 6 people, with a max of probably 16. The Keg 'O Health is difficult to get to, set up high, so if you manage, you've got not only the 199 health, but a nice sniping area, for as long as it will last you. Arbitrage fakes curved surfaces well too (see the screenshot), adding a nice ambiance to the whole deal. Replayability isn't that great with this level, as you'll find you will master it rather easily. Still, it's a worthwhile pickup, and should present itself with a strong presence on the server circuit. I found this to be one of the better maps for tight fighting conditions. Just turn the lights down low. It doesn't have any technical issues whatsoever, which is more than I can say for a lot of maps out there. I think I played this one on a server several times. Why they run this when they're better maps out there is beyond me.